I have a browse menu and I need to make action of a button (approve button) so if the button is selected the button will change the field value into 1 and disable the change and delete button and also change the button string value into unapprove . But if the button were selected again the value will be return into approve and the value change into 0 and the button of change and delete will be return to enable again . can anyone can help ? Does anyone can help this issue? There’s some stuff here that would kind of depend on the underlying data, rather than just coding a button. Do you intend to enforce these rules (being allowed to modify/delete) elsewhere in your application? Will any other apps ever use the same data? Is this an ABC app? not working what? Maybe this - PRh:sts = 1? or this - disable(?Change:4)? Or not working everything? 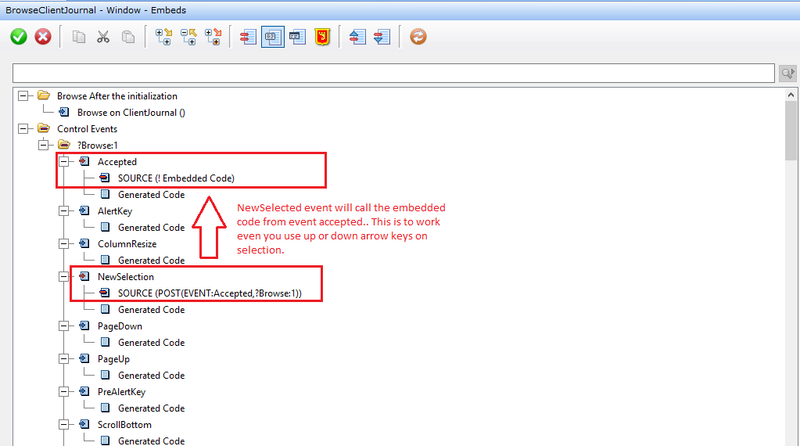 Pay attention that this code will executed only if ?button8 is selected. Also in one place you set one text (‘Unapprove’), in another you test it against different text (‘UnApprove’). If you want to disable the delete and change button in an ABC browse you need to embed your logic in the browse UpdateWindow method after the parent call. This method is going to enable disable those buttons automatically. Test your condition and enable/disable appropriately. The other option is to clear the browse classes control properties for delete/change. Replace BRW1 with your browse class name. Does it working after the button of change and delete were selected? cause I need the condition that if the sts field value is 1 or the button string were unapproved both button will be disable. As for my understanding, you are trying to create a browse for purchases that the user can “Approve” or “Unapprove” a purchase record right? Put it to the accepted event of the button. Put this codes after your codes for changing the value. and are all of those script will be added or only one of them? This script is for the browse accepted event.